When it comes to fire fighting equipment, the importance of signage is often overlooked. However, signage is incredibly important. Without proper signage, residents or users of your building won’t know how to escape in case of a fire. They also will be unable to locate emergency exits, alarms, and other safety features of your building. But you may not know where to start when purchasing fire safety signs for a new building. We’re here to help, with a guide to the most commonly-required fire safety signs for buildings in Australia! Read on, and protect the health and safety of your residents. Note: The specific types of signage that you will require for your building in Australia will vary based on your municipal signs and signals regulations, and fire safety orders. We recommend contacting your local government council to ensure you meet all of their requirements. Fire extinguishers and fire blankets are the first line of defense when it comes to fighting a fire. The location of fire fighting equipment such as fire blankets and fire extinguishers must be marked clearly. If you do not have clearly-marked fire extinguishers, you risk damage to your building and you endanger the safety of your residents. If nobody knows where your fire extinguishers are, they can’t use them – it’s that simple. If your building has built-in hydrants and hose reels, the fire hose reels must be marked clearly, so that firefighters can quickly access them in the event of a fire. Fire alarm call points must be clearly marked. Ideally, there should also be a fire action notice indicating what the user of an alarm should do next, and when they should expect firefighters to arrive. It’s also a good idea to place emergency fire exit signs and maps of escape routes next to fire alarms. This will aid residents and workers, and help them find assembly points to escape the building in case of an emergency. Usually, your emergency telephones will be located next to a fire alarm. However, if they are elsewhere, it’s a good idea to have them clearly marked, so that building residents can quickly get in touch with emergency authorities. Emergency exit signs with directional arrows are the most common types of safety signs and signals used today. While some of the other signs on this list are not absolutely mandatory, this is not the case with emergency exit signs. Typically, most municipalities require escape routes to be marked with directional arrows. Emergency exits should be indicated, as should fire escapes for buildings that are multiple stories in height. 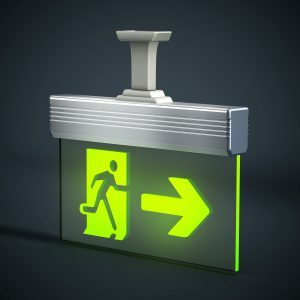 Emergency exit signs usually also incorporate some kind of emergency lighting system. Because the emergency lights are not tied to the power grid, they can help illuminate exits even if a fire has damaged the building, or smoke is making it difficult to see. If your emergency fire plan has a designated assembly point for residents or building users, it should be clearly marked with a sign. This allows for a more controlled evacuation, and ensures that residents are able to get out of the building in a quick, orderly manner. Fire doors must be marked with a prohibition sign, indicating that they are to remain closed at all times. Because fire doors are built to impede the movement of smoke and fire throughout your building, they must be kept closed in order to be effective. If your building has a sprinkler system, you should consider installing a sign indicating key systems, such as sprinkler valve shutoffs, the control center, and any other functionality that firefighters or building superintendents may need to use. Fire Safety Signs – Your First Line Of Defense! Fire safety signs are unsung heroes in the world of fire protection. A building that is properly protected and marked with the right signs and emergency exit indicators is much safer than a building that violates fire safety regulations. So don’t risk improper signage. Take another look at your building today. Does it comply with municipal safety regulations? Are there fire extinguishers and fire alarms that could use large, clear signage? Get in touch with Strategic Fire Solutions about our fire protection services in Brisbane. We can help you conduct a comprehensive building safety assessment, including a signage check.